Day One of Fashion Scout is well underway with shows from Merit award winner i-am-chen, Pam Hogg, the Swedish School of Textiles and many more. With an extensive line-up of shows, fashion scouts ss19 attracts a whole host of guests. 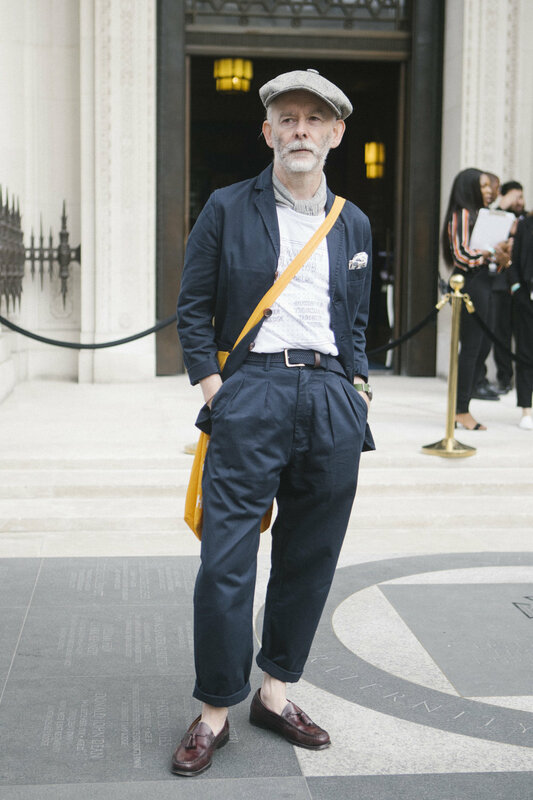 These are some of the streetstyle looks that were spotted outside Freemasons Hall. We noticed an array of trend-forward textiles such as a long-line snakeskin print trench coat and a 90’s inspired yellow check dress with a contrasting bodice layered over the top. Tailored jackets and suits were also seen. A bold, green suit that featured nostalgic floral prints was photographed and white leather cowboy boots demonstrated a 70’s theme that was apparent within some of the looks. One guest was seen wearing a lace mid-length skirt layered underneath a lime-green cut-out skirt that created a modern twist and elevated the look with the splash of colour. Bright hues were noticed on many other guests with one styling a rainbow 90’s-inspired puffer coat with customized leggings and another pairing a cobalt-blue kimono with an all-black look. It was refreshing to see a huge variety of looks that mix and matched many trends with their own unique style.